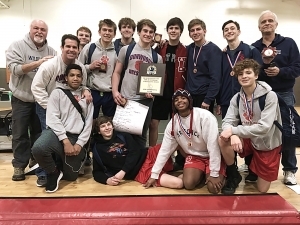 Charles McCowan’s gold medal victory in the 195 weight class sealed the Dunwoody Wildcats third DCSD William S. Venable County Wrestling Championships title in the past four seasons with a 186-181 win over the Southwest DeKalb Panthers. McCowan pinned Decatur’s JaCoryius Martin (20-4) to finish the tournament with four consecutive victories and three pin falls in a row. Dunwoody’s best finish in the first 54 years of the County Championships was second to Redan in 1990 before winning the 55th edition title in 2016 252-202.5 against McNair to raise the trophy for the first time. Coach Luke McSorley’s squad repeated in 2017 220-203 over Marist. McCowan’s win was the Wildcats only gold medal of the tournament, but coupled with silver medals by Parker Smith (126), Luke Pankey (145), Jack Holloway (160) and Tyler Rush (182) were able to out-point the Panthers for the win. 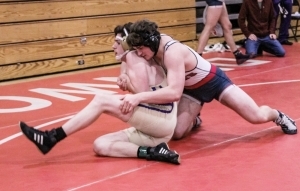 Dunwoody also had five other wrestlers finish in the Top 6. The 5.0 win ties for sixth closest finish in the 58 year history of the event and was the closest finish since Southwest DeKalb outlast Rucker 236.5-233.5 in the 2011 championships. The closest final was in 1974 with Towers defeating Chamblee 71.0-70.5. Southwest DeKalb finishes as the runner-up for the second consecutive season with one gold medal winner, three silver and three bronze. Jaheim Williams (17-6) came away with the 145 class gold medal with the decision over Dunwoody’s Luke Pankey. Keith Duckett (132), Xavier McKinney (152) and Jeunte McCray (106) picked up silver medals for the Panthers. Rodreyon Fears (113), Derrick Smith (182) and Reano Ramjag (195) all wrestled their way back to the bronze medal stand. Stone Mountain made a run for the title coming up just six points back in third with 180 points with three gold medals, one bronze and five other Top 6 finishes. Deejay McNeal captured the 120 weight class gold medal with a technical fall victory over Arabia Mountain’s Ahroya Coley. Antonio Mills picked up the gold in the 138 class with a pin of Marist’s J.T. Termini for the title. Derek Price (27-4) picked up the third gold for Stone Mountain in an exciting decision over Southwest DeKalb’s Xavier McKinney in the 152 weight class. The match was named the Jerun Tillery Best Finals Match of the tournament. Dameon Bush wrestled back to claim the bronze in the 132 class for the Pirates. Decatur came in fourth led by Ethan Duke’s gold medal performance in the 113 class along with silver medals by JaCoryius Martin (195), Alan Ferguson (220) and Brian Crawford (285). Stephenson edged out both Lakeside and Marist for fifth 136-135 with gold medals by Lance Foucha (132) and Cahlil Silimon (220) and a bronze by Alec Sanders (126). 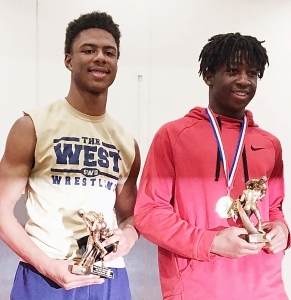 Foucha pinned Southwest DeKalb’s Keith Duckett for his gold while Silimon pinned Decatur’s Alan Ferguson for his win. Lakeside had five medalists in the tournament led including Jordan Bell (160), Cody Domingue (170) and Micah Carrier (182) winning gold. Bell (18-3) picked up a decision over Dunwoody’s Jack Holloway, Domingue (17-2) won the decision over Tucker’s Justin Carter and Carrier (12-4) pinned Dunwoody’s Tyler Rush. Komi Housimede (113) won a silver medal and Griffin McVeigh wrestled back to the bronze. Marist picked up a pair of gold medals with wins by Thomas Termini (106) and Dean Colton (285). Termini’s (31-8) gold came on a pin of Southwest DeKalb’s Jeunte McCray and Colton (15-3) pinned Decatur’s Brian Crawford (25-2). J.T. Termini (138) won a silver and Carson Hess (145) took the bronze. 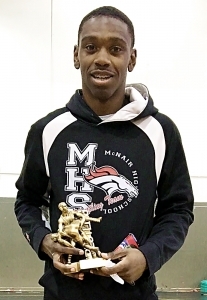 John Webb (18-0) collected McNair’s only medal of the tournament with his win at 126. Webb picked up the decision against Dunwoody’s Park Smith. Webb’s performance included two wins by fall as he remained perfect on the season and was named the William S. Venable Most Outstanding Wrestler for the tournament.